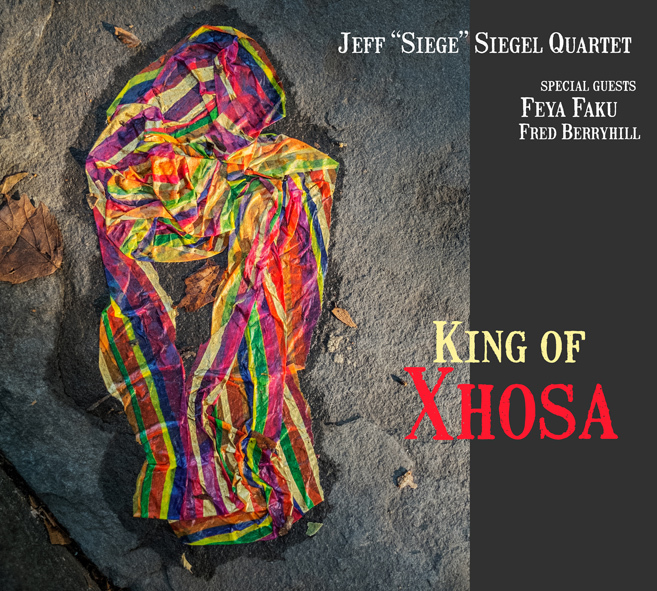 Artist Recording Collective (ARC) is proud to announce the January 17th release of “King of Xhosa” by renowned drummer and composer Jeff “Siege” Siegel. On the Jeff Siegel Quartet’s third studio recording, the stalwart drummer merges his high energy, straight ahead post-bop with the deeply spiritual stylings of trumpet master Feya Faku to produce a vibrant sonic tapestry of South African infused jazz. “King of Xhosa” brings together Siegel’s longstanding quartet comprised of saxophonist Erica Lindsay, pianist Francesca Tanksley, and bassist Rich Syracuse with percussionist Fred Berryhill and trumpeter extraordinaire Feya Faku. “King of Xhosa” will be celebrated at the Rosendale Cafe in Rosendale, New York on 1/21/17. Jeff Siegel and Feya Faku first came together in 2014 in Siegel’s home-turf of Woodstock, New York when Faku visited there to perform with Uhadi, his group of select South African musicians. Siegel was immediately drawn to Faku’’s sound. “From the first time I heard Feya in Woodstock, I knew that he had the perfect vibe, sound and soul to fit with my own quartet,” says Siegel. That summer, Siegel embarked on the trip of a lifetime to Cape Town and Grahamstown, South Africa, where he participated in the International Association of Schools of Jazz, and performed at the Grahamstown Jazz Festival. It was during this profound trip that the idea of a collaboration with Faku truly took hold. “Because African music is the roots of what we play as Jazz musicians, there was a feeling of being home while I was there,” he says, “…it was a blessing to meet, hear and play with wonderful musicians and experience the soul of Africa firsthand. Homage is a recurring theme on “King of Xhosa” with each of the nine tracks having been composed with specific inspirations in mind. On ‘Totem,’ the album’s opening ‘call to worship’ inspired by Xhosa dancers, Faku’s resonate vocals soar. On ‘Prayer’, composer Tanksley pays tribute to the “power of merciful love”, while Faku composed ‘Courage’ with his teachers in mind. Siegel’s poignant ‘Ballad of the Innocent’ is dedicated to the victims of the Brussells bombing while Tanksley’s ‘Life on the Rock’ is dedicated to each of the musicians on “King of Xhosa”. All in all, “King of Xhosa” is a celebration of the intersection of cultures. “I hope this music in some way reflects the deep respect I have for the great cultures of both Africa and the United States. While we are profoundly aware of the great pain that resulted in the birth of Jazz music, born from the tragedy of slavery, we are forever blessed with the positive outcome of the joining of these cultures in music. I pray that this recording shall add some positivity, inspiration and strength to a troubled world in whatever small way it can,” says Siegel. Drummer/Composer Jeff “Siege” Siegel is a veteran of the New York Jazz scene and has worked with a virtual “who’s who” of artists. He came onto the New York scene in 1980-83 as a member of the quartet of the legendary multi-instrumentalist Arthur Rhames. After six years with the group Second Sight, which featured trumpeter Dave Douglas, Siegel became a member of the Sir Roland Hanna Trio from 1994-’99. From the years 1990 – present he has been co-led several touring ensembles as well as The Jeff “Siege” Siegel Quartet. Simultaneously, from 2001 – 2015 Siegel was also a member of the Lee Shaw Trio from whom he also produced several cds and a dvd. As an educator, Siegel is a faculty member at The New School for Jazz and Contemporary Music, Western Connecticut State University, and The State University of New York at New Paltz .He holds a Masters Degree in Jazz from Queens College where he studied composition with Jimmy Heath. He has been the recipient of several grants from Meet the Composer and endorses Vic Firth Drum sticks. Please be on the lookout for two upcoming new cd releases with his quartet including “London Live” (ARC Records) and “King of Xhosa” featuring South African trumpeter Feya Faku. Feya Faku is an accomplished Jazz musician and composer. He graduated with a Diploma in Jazz Studies at the University of Natal in 1992 under the tutelage of Professor Darius Brubeck, pianist and son of renowned American pianist, Dave Brubeck. The trumpet and flugelhorn player has performed with a significant number of South African music legends. Based in South Africa, Faku travels frequently to perform on international stages with global counterparts. One of these long standing collaborations includes a partnership with the Paul van Kemenade Quintet, which now celebrates 20 years. In the past twenty years, Faku has partnered with the quintet on seasonal projects across Europeans stages. Faku has participated in teaching and fellowship programmes teaching trumpet and ensemble work. In April 2006 he participated in a residency programme in Switzerland teaching and performing with the Swiss-South African Quintet. The University Council of the Nelson Mandela Metropolitan University awarded Fezile a Council Prestige Award, one of the highest award awarded by the University Council. As recently as October 2012, Faku was Artist in Residence at the opening of the International Jazz School of the University of South Africa. Over the past two years Fezile has recorded several cds as a sideman and toured the U.S. extensively with the South African group known as “Uhadi” as well as with Kesivan Naidoo & The Lights.